Educational justice is based in the belief that all students should have the opportunity to go to school, graduate, and succeed. Right now, though, there are many barriers keeping students of color, LGBTQ youth, youth with disabilities, and low-income youth from having that opportunity to succeed in school. 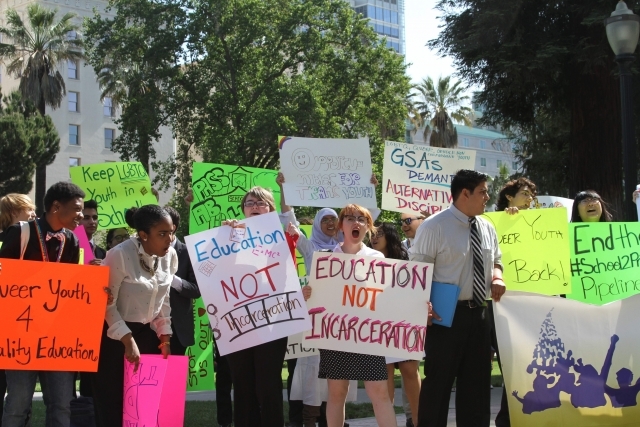 GSA clubs fight to tear down those barriers for LGBTQ youth and all marginalized students. The educational justice campaign workshop series is seven 30-minute workshops designed for individual GSA clubs to do during meetings. The series will help clubs better understand educational inequity across the country and in their own schools so that they can create an educational justice campaign. This workshop series is intended for developed GSAs that are activist clubs. Download these workshops and do them at your meetings to learn how your GSA can work for educational justice! DOWNLOAD THE FULL SERIES or check out each part below! GSAs and Educational Justice: This section is meant to help students understand the importance of educational justice and the ways in which LGBTQ students interact in/under their school climate. The School-to-Prison Pipeline and GSAs: This section is meant to help students understand what is the school-to-prison pipeline and how is it relevant to queer youth. The Game of K-12 Life: This section is meant to help students understand how the school-to-prison pipeline impacts youth and introduce some ways that students can push back. Visions for Justice in Schools: This section is meant to help students understand the importance of social justice, and the need to move from an equality framework to a social justice framework. GSA Values for Justice: This section is meant to help students understand the importance of a values statement in creating a safe and welcoming environment for all students. Activity: I Love My People Who…: This section is meant to help students appreciate each other within the movement and begin capturing how their schools contribute to the school-to-prison pipeline and school pushout. Educational Justice Campaign: This section is meant to help students develop the framework for an educational justice campaign, using the tools and knowledge developed through the previous workshops.